It’s been a while, yes? What can I say, I’m bad at posting regularly. Most of the blogs I follow, especially the ones that are travel related, have weekly updates. Mine? Not so much. As I said a few weeks ago, I wasn’t even sure I was going to continue blogging during this vacation, but I promised I would try my best and I haven’t given up! After leaving the hustle and bustle of Disney, Fran and I were looking forward to some much-needed downtime. 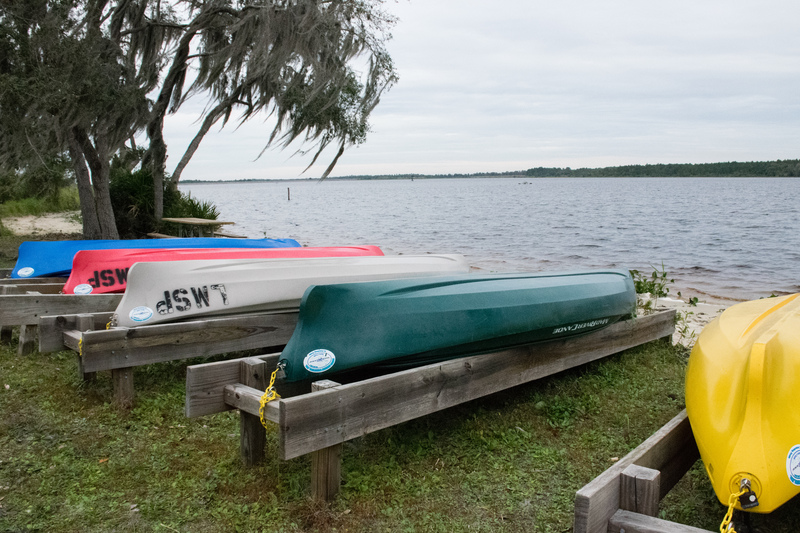 Our next stop was Lake Manatee State Park, about 30 or so mins southeast of St. Petersburg and just north of Sarasota. With the park being named ‘Lake Manatee’ many people would expect the fairly large body of water to contain the gentle sea cows. Nope. 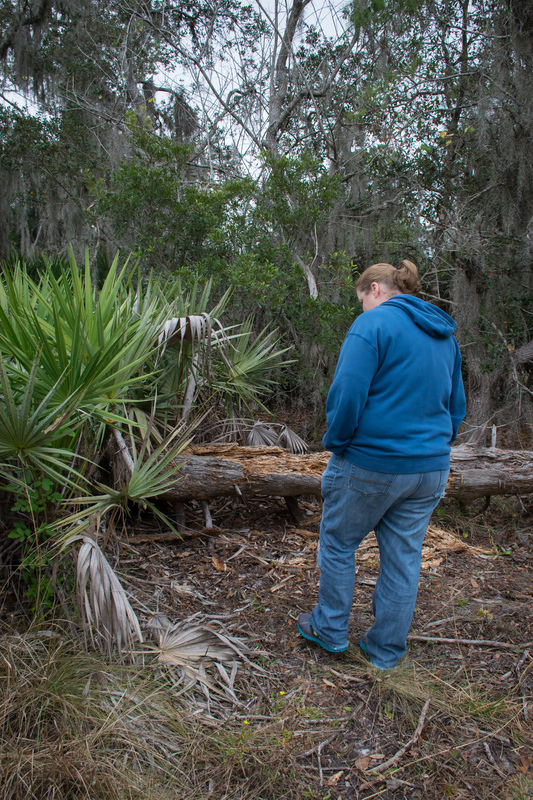 You won’t see any manatees in this erroneously named park due to the dam on the Manatee River. What you will find though are alligators. Oh joy! Even though we wanted to take it easy once we arrived, there was still plenty on our to-do list. Visits to Sarasota, St. Petersburg and Anna Maria Island were high up there, with segway tours to try, museums to check out and walks through beautiful sunken gardens rounding it all out. I also wanted to take the dogs to a popular dog beach that had stellar reviews. Unfortunately for us, the day after we arrived the weather turned pretty ugly with chilly temps, cloudy skies and random rain showers…so we only accomplished about 1/4 of what was planned. How did we spend our time? Well, for the most part, we hung around the campground and chilled out. We took plenty of walks with the dogs, organized our rig, cooked many meals on campfires, played board games and I picked up where I left off, doing some light painting with my camera. 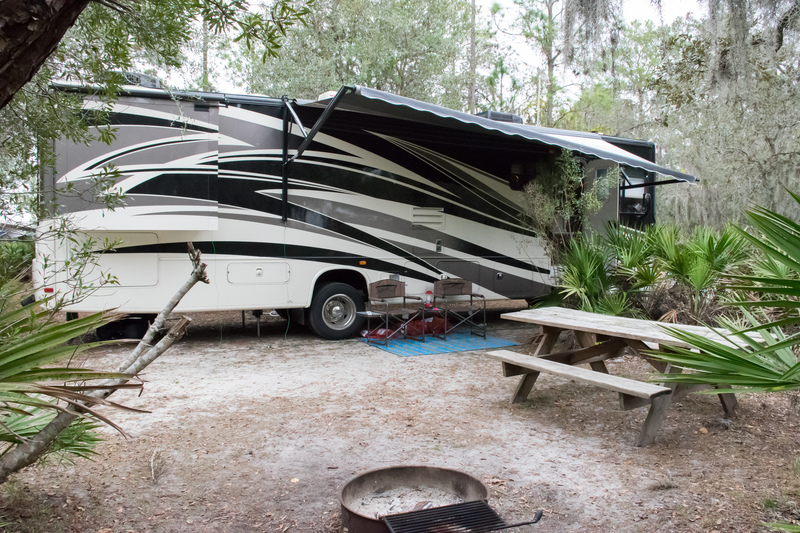 I have to say that our site (# 8) was probably one of the best in the campground. There was plenty of room, it was well shaded but still got sun (on the rare occasion that it popped out) and it was incredibly private. I walked around one day and wrote down what my other picks for decent sites were. The following would be my runners up – #37, #39, #53. All of those sites were similar to ours. The rest of the sites in the campground were ok, roomy and mostly level, but not very private. 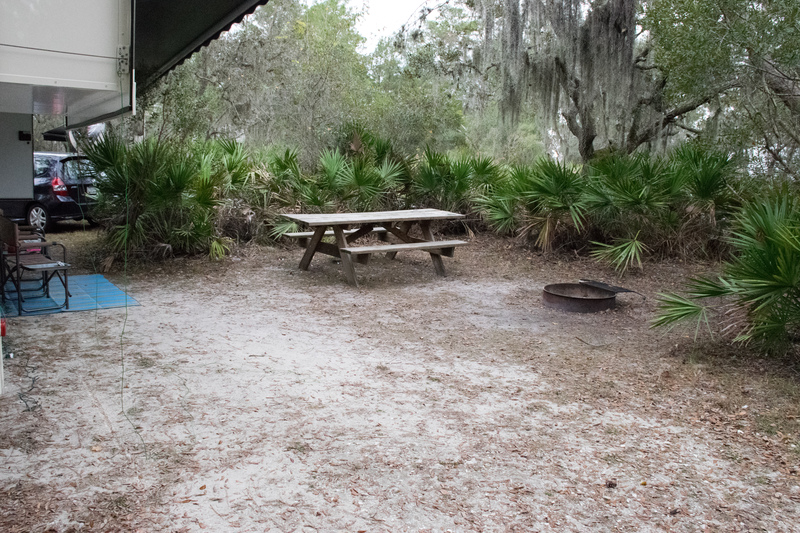 Lake Manatee State Park has water and electric at each site but no sewer hook ups, the dump station is located fairly close to the entrance to the campsite loops. Rather than walk our portable holding tank over to the station Fran decided to try to rig it to my car and tow it there, which went super smooth. One day we decided to do a little geocaching. We were both eager to keep busy with something fun and wanted a chance to oil our rusty skills…it had been almost a year since our last hunt. 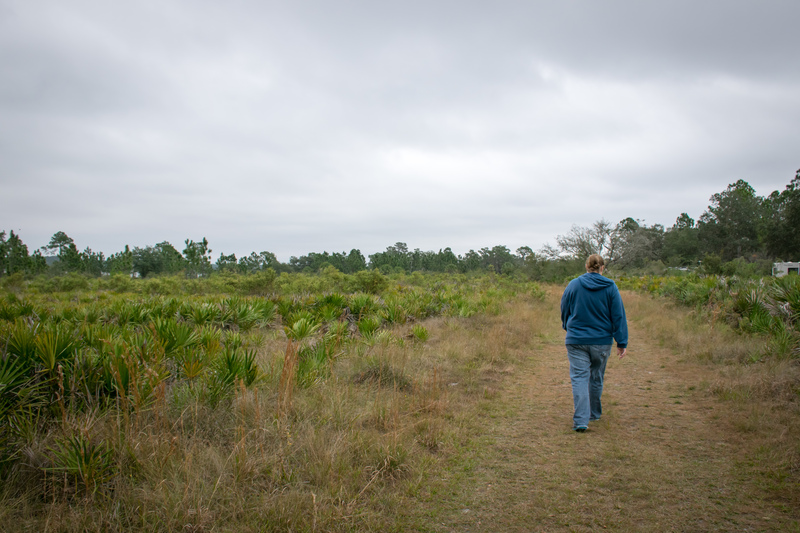 We decided that with the numerous warning about alligators, it’d be best to leave the dogs home in case we had to go off the beaten path for caches. I pulled up my app and searched for the nearest one, which wasn’t far from our campsite. I noticed that almost all the caches were hidden by the same person and all were titles of a song. How very crafty. They also stated that none of them were far off the marked trail, which seemed rather convenient. Our first attempt was a cache named When Doves Cry. As always, I am the navigator and Fran is the finder. Actually, that’s not entirely true. We both do the searching once we get to the spot, but there is no way in hell Fran could ever actually get us TO that spot. Directionally challenged 🙂 She is also much better at doing the finding than I am. But anyway…I get us to the right spot and we start searching. And searching. And then we did some more searching. After quite a while of this, we gave up…which wasn’t easy for us to do. It was the first time in our short history of geocaching that we failed at finding a cache, but it wasn’t the last. After the pic Fran said “We need to get out of here”, so we turned around and headed for yet another cache, grumbling to one another about our unsuccessful adventure. We both agreed it would have been pretty awkward (or pee in the pants scary) if I hadn’t been paying attention to where I was walking and stepped on the snake. I’m just happy that didn’t happen. Even though the snake was a harmless lil corn snake (I actually had an albino one when I was a teenager. Yes, really), it wouldn’t have been fun for either of us. We continued on our quest to find our first cache of the day. This one had us loop back around and take a similar path heading towards the campground. The skies started to darken. Rather than their usual dusty ‘chance of rain’ gray they were turning a dark and smokey ‘looks like rain for real this time, I’m not kiddin’ gray. We figured we should hurry it up. As we were walking along, heading to the spot my gps said the cache was, Fran jumped over to me and grabbed my arm. She said she saw another snake, a nice long black one. Awesome. We kept going. 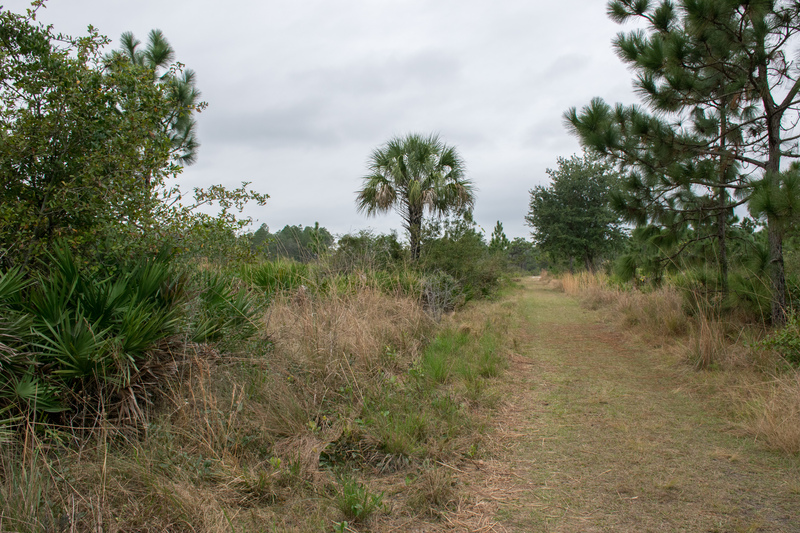 We finally made it to the spot and saw…another small single track trail leading off into the unknown. We looked at each other and basically said Hell to the No. We were done with coming up empty handed and being chased by snakes. And thus ended our geocaching in Lake Manatee State Park. So, the weather stunk and our geocaching adventure failed, but we still thoroughly enjoyed our stay. Mother Nature gave us a break, for a handful of hours each day, and we took full advantage of those times. We were able to make it over to Anna Maria Island for a quick tour and a bite to eat. 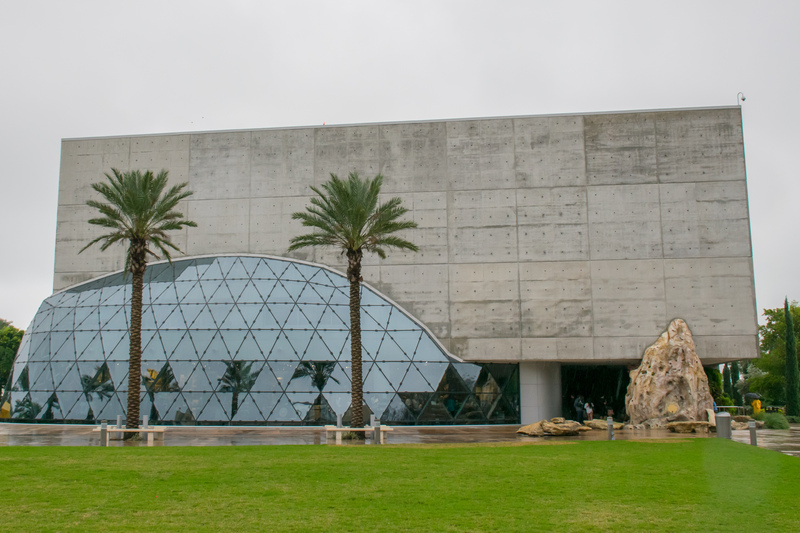 Another day we headed over to the Dali Museum, something I had been looking forward to for months. It was a Sunday and happened to be pouring on our way over, which made for a HUGE line of visitors, the likes of which the staff said they had never seen before. We waited patiently for our turn to get into the museum, which took almost an hour, but in my opinion the wait was so very worth it. The museum and collected works are of decent size but in no way gigantic, which made for a smaller and somewhat intimate setting. Included in admission is an audio tour, which really enhanced the entire experience. I have always been a very big Dali fan and now appreciate him and his works even more. I encourage anyone who has considered going to make the visit. On our way out of the museum and onto the highway I texted my mom to see where they were on their journey. My parents also happen to be snowbirds, choosing to stay in Cape Coral during the winter months, and they had hit the road a few days after Christmas. She texted me back saying that they had taken a detour to avoid traffic, which ended up swinging them down near St Petes. I explained that we were actually just leaving the city. She said they just passed the city. I asked her what mile marker they were at and we realized were only about 10 miles apart…talk about timing! 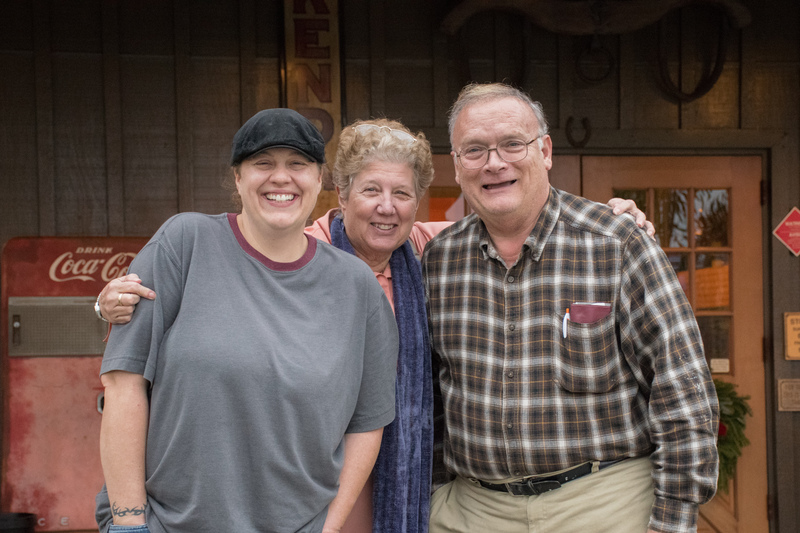 Since they needed a break from driving and we all needed some dinner we decided to stop and meet up for a bite. I still find it quite amusing that we just happened to ‘catch up’ with each other by pure chance. After our time in Lake Manatee wrapped up we hit the road and made our way down to Cape Coral, where we stored the RV and headed over to the house that we had rented. Yep, the ol’ switcheroo. Is that cheating? I guess maybe a little bit. But all Rv’ers need a break from time to time. With a bigger bed to stretch out in, some decent internet to surf on, a pool to float our boat, a yard the dogs could explore and a patio for their sunbathing…it would be a welcome change. The first day we arrived was amazing, super sunny and very warm. It was great to see that the fiery ball in the sky again and not have to be bundled up! After that day…it was all downhill. While the Polar Vortex was wreaking havoc on friends and family back home, it’s reach was actually quite widespread. We could feel it’s wrath, though not quite as brutal, here in FL. The Q-tips* in the area were quite distraught…they wanted their warm weather and sunshiny sunshine to return! And while I’ll admit I was pretty bummed that we couldn’t seem to shake the streak of bad weather, the chill in the air (upper 50’s daytime, mid 30’s at night) was much better than the teen and single digit temps so much of the country was dealing with. We both kept checking our weather apps looking for when it would break and found we would be stuck in the bad weather rut for almost our entire stay in Cape Coral. Déjà vu. Rather than bore you with all the boring details of how we tried to keep from being bored I will quickly sum up what we did to keep busy. We – Caught up on TV shows (well, Fran did, I’m not a TV person), dinned out, visited family, strolled through a giant farmer’s market, played with the dogs (Ozzie & Harry are even better at well known commands than before), discussed our next stops, snuggled on chilly days, continued work on a lil project we have going and read. And read. And read. We have been here a little over a week and I have completed 3 books. Go me. Finally after over a week of gloomy weather, the skies cleared this weekend and temps got into the upper 70’s, hooray! Yesterday we spent the day soaking up rays and swimming in the pool with the dogs. Later on we met up with Fran’s mom and step dad for dinner and had some delicious seafood. Today will be spent packing up and prepping to hit the road again while making time for a quick visit over to my parents to say our goodbyes. Tomorrow is Moving Day and I am very much looking forward to it, there is still some steam left in this vacation. Let’s all keep our fingers crossed for better weather for the next leg of our journey! Tags: cape coral, dogs, Florida, geocaching, LGBT, motorhome, RVing, travel. Bookmark the permalink. 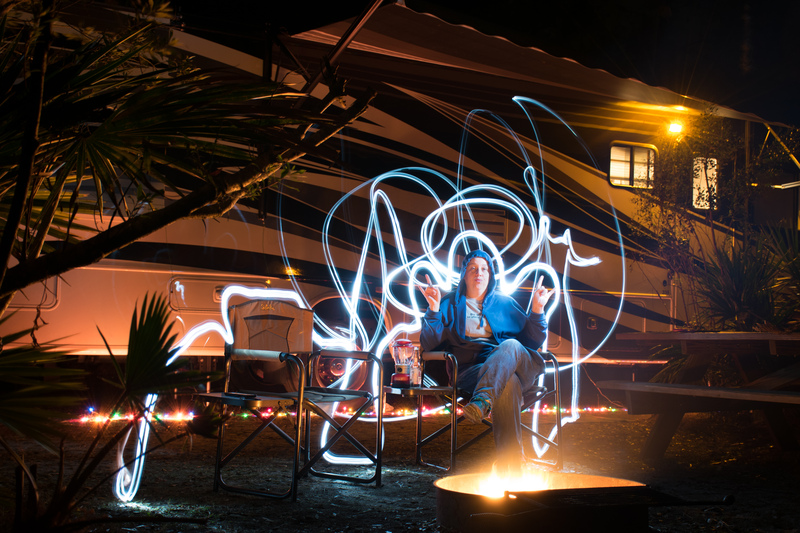 Glad you decided to keep blogging – Love the photos and the light painting! I will have to try that. Hope the weather improves for you – it was almost 60 here today. Thanks Linda! You would definitely enjoy light painting. It can become an obsession, so be prepared! I try to do some every year, most of the time when we are on the road doing the RV thing. Hope all is well and that crazy Philly weather calms down a bit soon! Also glad you decided to keep blogging! We, too, travel with our dog. We only have one, but she is an awesome rescue. We are getting ready to head to Frog Creek in Palmetto. The weather is cold (Florida cold) and I sure hope it warms up soon. I may try to squeak in a visit to the Dali Museum, I’ve seen it, just never been inside. In the meantime, try to enjoy our lovely Florida weather!!! It’s so awesome to be able to travel with your furry little ones, they are family too, as I’m sure you know! We have never been to Palmetto but have passed close by, it looks lovely. Temps warmed up a bit here but then took a dive again though the forecast says they should be on the rise again soon, hope we all get some sunny, warm weather! Enjoy your travels, I look forward to hearing about them! The light tricks are awesome – love them! The doggies look happy 🙂 Miss you guys!